‘Jurassic World’ Sequel, ‘Saving Faith,’ Holiday ‘Mysteries,’ More on Home Entertainment … Plus a Giveaway! Celebrate the newest installment of the action packed Jurassic franchise when “Jurassic World: Fallen Kingdom” arrives on 4K Ultra HD, 3D Blu-ray, Blu-ray, DVD and On Demand Tuesday Sept. 18, featuring more than an hour of bonus content— including star Chris Pratt’s behind-the-scenes Jurassic Journals captured on-set. The action adventure also is available now on Digital and via the digital movie app Movies Anywhere. Building on the wonder and adventure that has mesmerized audiences worldwide, “Jurassic World: Fallen Kingdom” continues with a stunning new chapter filled and more dinosaurs than any other “Jurassic” film. Pratt (“Jurassic World,” “Guardians of the Galaxy” franchise) and Bryce Dallas Howard (“Jurassic World,” “Pete’s Dragon”) return as Owen Grady and Claire Dearing with original cast members Jeff Goldblum (“Jurassic Park,” “Thor: Ragnarok”) and BD Wong (“Jurassic World,” “Law and Order: SVU”) reprising their iconic roles. Owen and Claire return to Isla Nublar three years after the destruction of the Jurassic World theme park to rescue any remaining dinosaurs on the island from a catastrophic volcano that threatens to leave dinosaurs extinct once again. Owen is driven to save his lead raptor, Blue, while Claire makes it her mission to preserve the creatures that she has grown to deeply respect. When the lava begins to rain down, they soon discover terrifying new breeds of ferocious dinosaurs along with a conspiracy that could threaten the entire world. Joined by co-stars James Cromwell (“Babe,” “The Green Mile”) as wealthy entrepreneur Benjamin Lockwood, Dr. John Hammond’s partner in creating Jurassic Park, as well as Justice Smith (“The Get Down”) and Daniella Pineda (“The Detour”) as Franklin Webb and Zia Rodriguez, members of Claire’s Dinosaur Protection Group; this cast brings an extraordinary story to life as chaos erupts when Owen, Claire, and their team discover a most deadly endgame that could bring the planet back to prehistoric times. “Jurassic World: Fallen Kingdom” is directed by J.A. Bayona (“The Impossible,” “The Orphanage”) and executive-produced by Steven Spielberg and Colin Trevorrow. 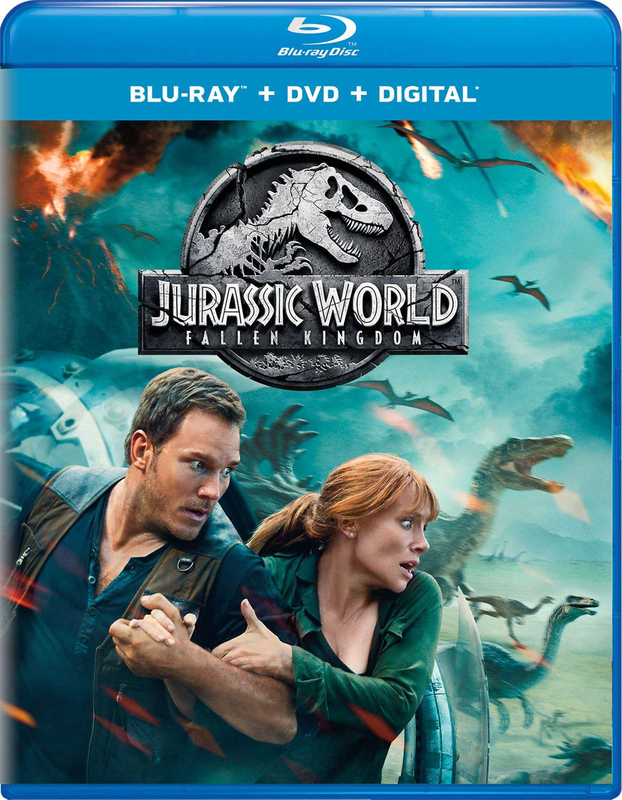 In addition to numerous extras on the DVD, 4K Ultra HD, Blu-ray and Digital, exclusive extras on the 4K Ultra HD, Blu-ray and Digital include “The Kingdom Evolves,” a featurette in which the filmmakers discuss how the second chapter in the “Jurassic World” trilogy pushes the franchise in a new direction; Return to Hawaii” featurette in which cast and crew discuss shooting the film in Hawaii; “Island Action,” behind-the-scenes look at the bunker scene and runaway gyrosphere sequence; “Aboard the Arcadia,” a featurette in which cast and crew discuss working with the animatronic dinosaurs and “Start the Bidding,” a behind-the-scenes look at the auction scene. The inspirational and heartwarming family film “Saving Faith” arrives on DVD, Digital and On Demand Tuesday Sept. 18 from Lionsgate. Including music by Donny Richmond and Sunday Drive with appearances by Vince Gill, Amy Grant, Phil Vassar, and members of the Gatlin Brothers and Rascal Flatts, the DVD will be available for the suggested retail price (SRP) of $19.98. In this gospel-driven drama, Faith Scott (Jenn Gotzon, “Frost/Nixon,” “God’s Country”) is ready to give up hope. Her struggling small-town theater is about to get foreclosed by the bank—when her charming Uncle Donny (Donny Richmond, “The Christmas Reunion”) convinces his famous friends to play live and save the business. But when a local developer decides to sabotage the concert, it’ll take a miracle to make the show go on. Against all odds, Faith and Donny turn to their faith and friends to help pull off the impossible. The film also stars Jim Chandler (“The Quad”), Henry Cho (“Say It Isn’t So,” “Material Girls”) and Victoria Jackson (“UHF,” “The Last Laugh”). “Saving Faith” is approved by the Dove Foundation for all ages. The DVD and Digital editions include the featurette “Making Saving Faith,” the “Not Alone” music video by Jimmy DeTalente and The Electric Revival, plus outtakes. The second season of CBS’s hit reboot of the ‘80s classic comes home when “MacGyver: Season 2” arrives on DVD Tuesday Sept. 18 from Lionsgate. Starring Lucas Till as Angus “Mac” MacGyver, the thrilling reimagined series returns with even more adventure for the secret government operative who uses his extraordinary talent for unconventional problem-solving and vast scientific knowledge to save lives. Loaded with never-before-seen extras, including three featurettes, including one about MacGyver in Cuba, a gag reel as well as deleted scenes. “MacGyver: Season 2” on DVD will be available for a suggested retail price (SRP) of $29.98. “Murdoch Mysteries: Home for the Holidays” makes its DVD/Blu-ray debut Tuesday Sept. 18, from Acorn TV. Set in Toronto in the late 1890s and early 1900s during the age of invention, “Murdoch Mysteries” (a.k.a. “The Artful Detective”) centers on Detective William Murdoch (Yannick Bisson), a methodical and dashing detective, who enlists radical new forensic techniques to solve some of the city’s most gruesome murders. He must solve a holiday whodunit in this feature-length special of the award-winning mystery series. Days before Christmas, Murdoch and his wife, Dr. Julia Ogden (Gemini winner Helene Joy, “Durham County”), travel to Victoria, British Columbia, to spend time with Murdoch’s eccentric brother. But instead of a relaxing holiday with Jasper (Dylan Neal, “Dawson’s Creek”) and his family, they end up investigating a murder at an archaeological site. Back in Toronto, Constables Crabtree (Jonny Harris, “Still Standing”) and Higgins (Lachlan Murdoch, “Copper”) try to impress their sweethearts before a skiing outing, and Inspector Brackenreid (Thomas Craig, “Where the Heart Is”) and his wife invest in a money-making scheme run by a man named Ponzi. Guest stars include Kate Hewlett (“The Girlfriend Experience”), Jake Epstein (“Degrassi: The Next Generation”), and Megan Follows (“Reign,” “Anne of Green Gables”). The DVD/Blu-ray features a feature-length Christmas special from Season 11 and bonus behind-the-scenes featurettes ($24.99, Amazon.com). “Murdoch Mysteries: Home for the Holidays” made its U.S. debut last December on Acorn TV. The series is currently in production on Season 12. “American Horror Story: Cult” arrives on DVD Tuesday Sept. 18 from Twentieth Century Fox Home Entertainment. Surrender your will to all 11 episodes of the seventh season of one of TV’s most terrifying series. It is post-election 2016, and Ally Mayfair-Richards (Emmy winner Sarah Paulson), a Michigan woman plagued by phobias, attempts to find happiness as a restaurateur alongside her chef wife (Alison Pill) and son. But Ally’s family—and her grip on reality—are threatened by the arrival of Kai Anderson (Evan Peters), a politically motivated cult leader who’s plotting an unthinkable mass murder. 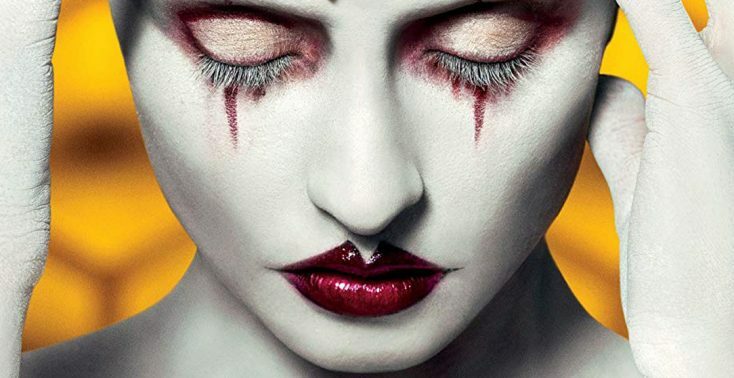 Co-starring Cheyenne Jackson and Billie Lourd, “American Horror Story: Cult” is a scare-fest served up with social commentary, pinky swearing, clown suits and gas lighting. The events that led to the deadliest terrorist attacks ever to take place on American soil are chronicled on “The Looming Tower,” the powerful 10-part drama to be released on Blu-ray and DVD Tuesday Sept. 18, by Warner Bros. Home Entertainment. Adapted from the bestselling, Pulitzer Prize-winning novel by Lawrence Wright, the series reveals the untold story of the September 11 attacks on the World Trade Center and two other terrorist hijackings and how the secret rivalry between the FBI and the CIA may have inadvertently set a path for the tragedy to take place. The series, which premiered on Hulu in February, has received critical praise and features an all-star ensemble cast that includes Jeff Daniels (“Godless,” “The Newsroom”), Peter Sarsgaard (“Wormwood,” “The Killing”), Tahar Rahim (“A Prophet”), Michael Stuhlbarg (“Call Me by Your Name,” “The Shape of Water”), Bill Camp (“The Night of”) and Wrenn Schmidt (“Person of Interest”). The thought-provoking drama is available in its entirety, plus all-new bonus content. The Blu-ray release will be available for an SRP of $39.99 and the DVD release will be available for an SRP of $29.98. “The Looming Tower” also is available to for purchase on Digital via digital retailers. Fans can enjoy all 10 episodes in high definition and standard definition (retail $24.99/$18.99) along with never-before-seen bonus content. The series traces the rising threat of Osama Bin Laden and Al-Qaeda in the late 1990s and how at the time, the FBI and the CIA may have inadvertently set the path for the tragedy of 9/11. The series follows members of the I-49 Squad in New York and Alec Station in Washington D.C., the counter terrorism divisions of the FBI and CIA, respectively, as they travel the world fighting for ownership of information while seemingly working toward the same goal – trying to prevent an imminent terrorist attack on U.S. soil. Daniels stars as I-49 Squad chief John O’Neill who faces a deliberate lack of cooperation from other intelligence organizations within the federal government, after he’s convinced the United States has been targeted for an attack by Al-Qaeda. His counterpart within the CIA, the frequently antagonistic Martin Schmidt (Sarsgaard), assumes the CIA is the only government agency equipped to battle potential terror threats from abroad. He disobeys presidential orders and purposely keeps information from the FBI. Although the goal of both organizations is the same, preventing a terrorist attack from happening in the U.S., the competitive nature between the two agencies and their inability to work with one another, may have given Al-Qaeda operatives in the U.S. the opportunity to put their devastating plan in motion. Produced by Legendary Television, “The Looming Tower” is executive produced by Oscar-nominated writer Dan Futterman (“In Treatment,” “A Mighty Heart”), Oscar and Emmy-award-winning documentary filmmaker, and director Alex Gibney (“Going Clear: Scientology & the Prison of Belief,” “Taxi to the Dark Side”), Lawrence Wright (“Going Clear: Scientology & the Prison of Belief,” “The Siege”), Craig Zisk (“Parks and Recreation,” “Brooklyn Nine-Nine”) and Adam Rapp (“Vinyl,” “Flesh and Bone”). Front Row Features is giving away one of the summer’s biggest blockbusters to three lucky readers. For your chance to win a copy of “Jurassic World: Fallen Kingdom” on Blu-ray/DVD Combo Pack, simply email socalmovieeditor@aol.com by Sept. 26 with your favorite dinosaur in the body of the email to enter the contest. Good luck! Next PostPhotos: ‘Jurassic World’ Sequel, ‘Saving Faith,’ Holiday ‘Mysteries,’ More on Home Entertainment … Plus a Giveaway! Angela Dawson is the editor and co-owner of frontrowfeatures.com. An award-winning journalist, she has covered Hollywood since 2000. Her interviews with actors, directors, writers, authors and musicians have run in numerous outlets. She is the author of the novel "Generations: A Greek Family Odyssey" available on Amazon.com. Photos: ‘Replicas,’ ‘Glass,’ More Available on Home Entertainment … Plus a Giveaway!!! ‘Replicas,’ ‘Glass,’ More Available on Home Entertainment … Plus a Giveaway!!! FrontRowFeatures.com © 2011-Present All Rights Reserved.